Leaving a direct link to your blog in your comments! I think you’ll like this one…I know I do! You know how many of us leave our blog links in our comments to others? But they aren’t live links so you have to do the cut and paste thingy to see someone’s blog? Well, this will help to make a live link back to your blog, which would be so wonderful! I mean, I just love finding new blogs…and I know you do too! *Note: I had to leave some spaces so it wouldn’t automatically make a live link…you should have NO spaces, except after the “a” in “a href”. 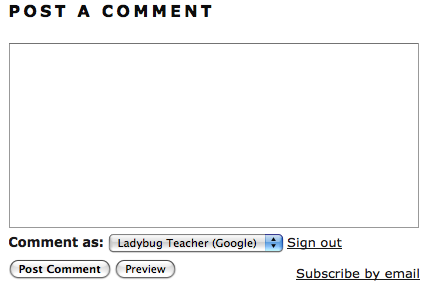 Once you hit “Post Comment”, it will show as a live link back to your blog!!! Blogger Tutorial: More on making buttons! Thanks for the Stylish Blogger Award! Yay! A direct link rocks! Thanks for the tip! Love it! Mrs. Saylor’s Log I also LOVE your blog! It is so helpful! lol…I need tutoring! Thanks for the great idea! I'm trying it out as well. Thanks for the tip and I love your blogs! I LOVE that you posted this bc I seriously felt dumb trying to figure it out on the Teachers Talk website! thanks love! I love learning something new!! Thanks!! Thanks for this post. I got the signature to work but this one is a bit tough. Will keep trying. Finally got it to work. It must be getting late. Thanks again. I think I have the hang of it!! Thanks for all your tips!! I just wanted to test it out…. I am giving it a try! Quick question- Do you have to retype it each time you comment or is there a way to save it? Hmmm, I messed it up. Let's try again! Thanks for the wonderful tutorials!! Think I got it, thanks. Let's try again, thanks so much!!! I'm going to be so excited if this works! Not sure why – but my link in the post above goes back to your site (at least from my computer) – very strange, especially since I put in my blog. Any suggestions? Thanks so much! Love this tutorial! How simple, and yet it will make things much easier to check out everyone's blogs! Leaving a direct link is a great way to bring new friends to your blog! Thank you so much! I love all of your tutorials. O.K. third times a charm! !